It's fitting that Sony chose GDC 2016 to unveil the final price and release date for PlayStation VR, the virtual reality headset it unveiled at the conference two years ago. And while there's a definite nostalgia factor about the announcement, there's also a pragmatic one, too: March is the month of VR launches. Between Oculus's arrival later this month and the HTC Vive developer units that have shown up at studios' doorsteps, if Sony wanted to keep potential customers interested, today was the day to do it. To that end we now know the price of Sony's PS4-exclusive VR set: $399/£349. Not only that, but we know when it's going to arrive, too: October 2016 is when you can go out to a local electronics store or, more realistically, officially order one online. For comparison, PlayStation VR's biggest competitors on PC – the Oculus Rift and HTC Vive – come in at $600 and $800, respectively. Andrew House, President of Sony of America said there are over 230 developers working on games for PlayStation VR during a press conference today at GDC. "Fear. Exhilaration. Power. ... These are just a few of the emotions gamers will experience in the launch line-up of games for the PlayStation VR," House said before unveiling the specs for the final consumer version of the headset. It will have a 5.7-inch, 1920 x RGB x 1080 OLED display with a 120Hz refresh rate. 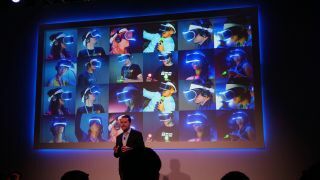 Gamers will have a 100-degree field of view while using the PSVR and can expect use either DualShock 4 or PlayStation Move Controller. A unique Star Wars Battlefront experience will be among one first many users will be able to play on their PlayStation VR. And this will be the first of 50 games Sony has promised to release this year. We'll get to play a bunch of short demos of PlayStation's first batch of VR games at GDC 2016, so stay tuned for our updated impressions.